Five Questions About The Jess Walter/Beautiful Ruins Phenomenon, a Timely Post as Walter is Coming to Boswell on Monday, May 6, 7 pm. A. What is Beautiful Ruins anyway? While Jess Walter's novel jumps all over the last fifty years, there are two basic plotlines. In 1962 in a dying fishing village, Pasquale, a struggling hotelier takes in an actress who has a small part in Cleopatra. She's dying of cancer, and has set up a rondezvous with someone else on the set. Dee is Pasquale's only guest, and perhaps only one of two foreigners ever to visit the hotel. The other is a writer, Alvin Bender, who comes every year to not finish his novel (and to drink a lot). The second timeline is contemporary. A young assistant has been tasked with taking pitches while her boss, Michael Deane, a famous producer who hasn't been able to have a hit movie in years but might be onto a great idea for a trashy multi-platform dating show, stays home. Interrupting her last pitch of the day is Pasquale, who fifty years later, has taken it upon himself to find Dee, with Michael Deane's card in his hand. The story is how their tales and over a dozen other characters, including Richard Burton, intersect. Oh, and we get to read excerpts from a screenplay, a novel, a memoir, and a stage play, among other things. Funny that the Maria Semple employs a similar concept of found narrative, as I call it. She's coming May 1, by the way, 7 pm. B. How did I first hear about Beautiful Ruins? Interestingly enough, I think the first person who told me to read Jess Walter's novel was Dave, the former buyer at Next Chapter. Our tastes overlapped a lot, which we knew from back when we both worked at Schwartz. He was over the moon about the book and got a whole bunch of people to get on board. We wound up selling the book pretty well, but I knew that they had blown us away, numbers wise. I think the high numbers got Milwaukee onto the paperback tour. I consider our event a sort of gift from Next Chapter, a thank-you gift for taking over a lot of their events at the last minute when they closed. C. Where did Jess Walter come from and why does everyone seem to love him? This is Jess Walter's seventh book and sixth novel (it was followed by a book of short stories). He's been shortlist for the National Book Award, been a New York Times notable book of the year, and taken home an Edgar for best novel. One of his novels was Time magazine's number two book of the year (which I think just means that Lev Grossman really loved it). The Thing that's amazing is that all this is for something like four different novels, although previous to Beautiful Ruins, it was The Zero that got the most acclaim. Our sales on The Financial Lives of Poets (2009 hardcover, 2010 paperback) were slightly better than what the Downer Schwartz did for The Zero (2006 hardcover, 2007 paperback), but that has generally been the case for literary authors as our sales have increased. They were respectable, 8-10 copies each in paperback, but nothing like this. I held onto hardcover copies of each, without actually reading them. I was convinced I would one day get around to it. I knew the author was important, and I knew I'd like him, but there's this problem--I can't read fast enough! That midcareer breakout is so sweet, and justifies old fashioned publishing models. One of the great things about publishing literary work as opposed to commercial properties is that good reviews and word of mouth can turn around a bad track record. And there's no question that Harper put their hearts behind this. As Walter tells it, he lives in Spokane, the city of his birth. He's got three kids. He came out of journalism. He writes in the mornings. Here's a few more questions answered from an interview with Noah Charney in The Daily Beast. D. What exactly broke out this book to become the #1 bestseller in the country? Honestly, I'm still trying to get the story about that. I'm hoping it will show up in the New York Times any minute. I know that the indies positioned it, but I just don't think we can get a book like this to #1 without another channel jumping on board. This used to happen all the time with Borders, which loved to break out trade paperback literary fiction. So who has taken up the mantle? The thing that's so amazing to me is that it's everything I love in a novel--multiple plotlines and timelines, humor, sadness, big characters, moral gray areas, big questions. Reading the book, I was reminded of some of my favorite authors--Don Lee, Frederick Reiken, Peter Cameron. It's Jennifer Egan without sweeping all the major awards. I came to the book late. I was telling people all last fall "this is my favorite book of the year I haven't read." I'm glad it lived up to my own hype. The cover has certainly not hurt the book. Cheers to Harper for being smart enough to keep it for the paperback. Jeers to Random House for that paperback cover of The Unlikely Pilgrimage of Harold Fry, by the way. The entire staff of Boswell's is in agreement that the paperback jacket just doesn't work. 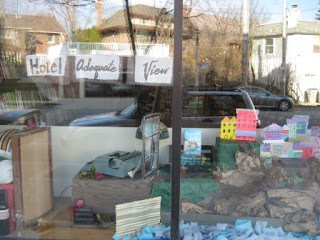 E. When a book is this popular, it's time to do a window, right? Stacie, what were you thinking? "When you asked for volunteers to make a window for Beautiful Ruins to promote the event, mentioning how nice it would be to somehow recreate the gorgeous cover, I got really excited. I love dioramas and have had so much fun doing similar things for window displays in the past (baseball stadium, pirate ship, Wind in the Willows Christmas, Ian Rankin). I asked Hannah, who loved the book, for any thoughts on scenes or characters she thought would lend a nice touch. So, she is behind the idea of recreating not only the cliffside village with its colorful architecture, but also the writer's hotel room with his typewriter, libations of an alcoholic nature, cigarettes and an exquisite view of said village (even though the hotel's name might imply otherwise). "For any of these displays, I generally just wander around the store and the storage room to look for inspiration. For the pirate ship, it was this oddly shaped box liner with 3-D squared edging. For this, it was the brown packing paper that shows up with boxes of books. They would be perfect for the rocky cliffs! From there, it just sort of came out organically as I stumbled across bits and pieces: a red wood table, wood podium top, and bag of fake snow helped make the bed; loads of colored paper, sharpies and Scotch tape made the buildings; brown tissue paper stands in as the winding dirt/gravel roads throughout the village and down to the water; and --oh, the water!-- the water is four shades of blue crepe streamers so I could vary the shade from lighter in the shallow, coastal edges, out to darker for where it gets deeper, overlapping the colors to guide the transition. I can't believe I get paid to do this kind of stuff, I love it!" We love it too! I'm so thrilled to be hosting this event with Jess Walter. Join us on Monday, May 6 at our now-classic starting time of 7 pm. This Week's Events--Rebecca Kanner, Joshua Henkin, Maria Semple, Ron Faiola, Jerry Pohlen, Michael Pollan (tonight) and Six Hand-Picked Undergraduate Creative Writing Wunderkinds from Marquette, Alverno, and Cardinal Stritch. So much to do today! Here is Stacie's upcoming event listings for this week, plus a sneak preview at Jess Walter's event next Monday. More about that in a post later this week. Monday April 29, 7:30 pm, at the Oriental Theatre. The Oriental Theater is located at 2230 N. Farwell Ave. Doors open at 7 pm. This event is $30 and includes a copy of Cooked, or on the night of the event only, a $20 Boswell gift card. This event may sell out. Tickets are still available at the time of posting. From the bestselling author of The Omnivore's Dilemma comes a kitchen-focused exploration of the enduring power of the four classical elements—fire, water, air, and earth—to transform the stuff of nature into delicious things to eat and drink. Apprenticing himself to a succession of culinary masters, Pollan learns how to grill with fire, cook with liquid, bake bread, and ferment everything from cheese to beer. In the course of his journey, he discovers that the cook occupies a special place in the world, standing squarely between nature and culture. Starting with the theory that “Cooking, above all, connects us,” Pollan ventures into the kitchens of others: a North Carolina barbecue pit master; a Chez Panisse-trained cook; a celebrated baker; and finally, several mad-genius "fermentos" (a tribe that includes brewers, cheese makers, and all kinds of picklers). Arguing that by giving over this practice to corporations means we weaken not only the sustainability of our communities, but also our most social relationships—the ones we have with family and friends. By reclaiming cooking as an act of enjoyment and self-reliance, and learning to perform the magic of these everyday transformations, we can open the door to a more nourishing life. About the Author: Michael Pollan’s books include The Botany of Desire, The Omnivore's Dilemma and In Defense of Food, all New York Times bestsellers. A longtime contributor to The New York Times Magazine, he is also the Knight Professor of Journalism at Berkeley. In 2010, Time magazine named him one of the one hundred most influential people in the world. Appearing with Rebecca Kanner, author of Sinners and the Sea. Labeled “A keenly observed and compassionate novel” by Entertainment Weekly and “Insightful… Poignant… Elegant,” by The New York Times Book Review, Henkin’s newest novel, The World Without You, is a moving, mesmerizing new novel about love, loss, and the aftermath of a family tragedy. It's July 4, 2005, and the Frankel family is descending upon their beloved summer home in the Berkshires. But this is no ordinary holiday. The family has gathered to memorialize Leo, the youngest of the four siblings, an intrepid journalist and adventurer who was killed on that day in 2004, while on assignment in Iraq. The parents, Marilyn and David, are adrift in grief. Their forty-year marriage is falling apart. Clarissa, the eldest sibling and a former cello prodigy, has settled into an ambivalent domesticity and is struggling at age thirty-nine to become pregnant. Lily, a fiery-tempered lawyer and the family contrarian, is angry at everyone. And Noelle, whose teenage years were shadowed by promiscuity and school expulsions, has moved to Jerusalem and become a born-again Orthodox Jew. The last person to see Leo alive, Noelle has flown back for the memorial with her husband and four children, but she feels entirely out of place. And Thisbe —Leo's widow and mother of their three-year-old son—has come from California bearing her own secret. About the Author: Joshua Henkin is the author of the novels Swimming Across the Hudson (a Los Angeles Times Notable Book) and Matrimony (a New York Times Notable Book). His stories have been published widely, cited for distinction in Best American Short Stories, and broadcast on NPR's “Selected Shorts.” He directs the MFA Program in Fiction Writing at Brooklyn College. Daniel's rec: "On one July 4th weekend in the Berkshires, a family gathers together to remember the youngest sibling, Leo Frankel, a journalist killed in the line of duty. What they don’t know is that the parents are separating, the eldest daughter is having trouble conceiving, the widowed daughter-in-law is dating, and the two younger children, one proudly agnostic and childless, the other an Orthodox Jew in Israel with four sons, have a pile of resentment issues. The result is spirited family dysfunction writ large, albeit gentler than a Franzen, and served with a half sour pickle spear." Appearing with Joshua Henkin, author of The World Without You. The Bible neglects to give her a name, but in Sinners and the Sea, Rebecca Kanner gives her a voice. The woman is the wife of Noah, a woman who struggles to define herself in a drowning world as she seeks purpose and identity. Kanner weaves a tale that breathes an intricate and dynamic life into one of the Bible’s voiceless characters. Through Noah’s wife’s eyes we view a complex world where the lines between right and wrong, righteousness and wickedness blur. And we are left wondering would I have been considered virtuous enough to save? Desperate to keep her safe, her father gives his virtuous daughter to the ancient and righteous Noah who weds her and takes her to the town of Sorum, a land of out outcasts and pariahs. The 600-year old Noah prospers in Sorum; his wife gives him three sons, and, as he is the most righteous person in the land, has a town full of sinners in which to preach. Alone in her new life, Noah’s wife is faced with the hardships of living with an aloof husband who speaks more to God than with her, trying to make friends with the violent and sexual sinners of Sourm, and raising three sons who despite their righteous upbringing have developed some sinful tendencies themselves. When God tells Noah he will destroy the world by flood and to build an ark so that he, his wife, three sons, and their three wives can repopulate the earth, Noah’s wife’s trials only multiply. About the Author: Rebecca Kanner holds a Master of Fine Arts in Fiction Writing from Washington University in St. Louis. Her writing has won an Associated Writing Programs Award and a Loft Mentorship Award. Her stories have been published in numerous journals including The Kenyon Review and the Cincinnati Review. Her personal essay, “Safety,” is listed as a notable essay in Best American Essays 2011. She is a freelance-writer and teaches writing at The Loft in Minneapolis. Maria Semple, author of Where’d You Go, Bernadette? Who is Bernadette? Bernadette Fox is notorious. To her Microsoft-guru husband, she’s a fearlessly opinionated partner; to fellow private-school mothers in Seattle, she’s a disgrace; to design mavens, she’s a revolutionary architect; and to fifteen-year-old Bee, she’s simply Mom. When our story opens, Bernadette has disappeared and Bee begins a quest to find her. About the Author: Maria Semple is the author of This One Is Mine. Before turning to fiction, she wrote for Mad About You, Ellen, and Arrested Development. Her writing has appeared in The New Yorker. Semple lives in Seattle, where she teaches fiction, studies poetry, and tries to stay off the Internet. Daniel's rec: "The craziness of a Los Angeles family moving to Seattle and taking over a girls’ reform school is not lost on the locals, who have lived in the Emerald City since, well, since it was called the Queen City. Bernadette, whose previous career as a talented architect self-destructed, writes in her shed, half-heartedly feuding with her neighbor Audrey, while her husband Elgin works on a secret Microsoft project that will out-Suri Apple, and his new admin, by the way, is friends with Audrey and everyone’s children go to the same school, which is getting ready to raise money to move out of their rather unglamorous industrial park setting. Bernadette and Elgin’s daughter Bee is soon headed for boarding school (very un-Seattle), but before she goes, there’s nothing she wants more than a family cruise to Antarctica. I’m not usually one for epistolary novels, but Where’d You Go, Bernadette is more of a mashup of traditional narrative with emails, newsletters, and diaries. Add to this set up some pent up anger, lots of misunderstandings, off-the-wall characters, a little lust, and Bernadette’s disappearance, and you have a spirited romp (with a bit of heart too) worthy of one of the writers of “Arrested Development,” which in fact is what Semple once did." Appearing with Ron Faiola, author of Wisconsin Supper Clubs. With twice as many abnormal attractions than the first edition, Oddball Wisconsin: A Guide to 400 Really Strange Places boasts destinations for road trippers that are found off the beaten path. Including bizarre locations and events—such as Chainsaw Gordy’s Garden of Saws, the UFO festival in Elmwood, a confiscated submachine gun that once belonged to John Dillinger and the Partying Pink Elephant in DeForest—Oddball Wisconsin offers off-beat travel destinations and little-known historical tidbits to road trippers looking for a different sort of trip. Where was Liberace born? What is a hodag and how do you catch one? Where can you find Frank Lloyd Wright’s Taliesin and hear of its bloody history? What’s the deal with the house they call “Top Secret?” This newly updated guide for readers and travelers to the real Wisconsin—the birthplace of the snowmobile, the ice cream sundae and Orson Welles—answers all of these questions and more. About the Author: Jerome Pohlen is an editor and travel writer whose travel writing has appeared in the Chicago Reader, Readers Digest, and TimeOut Chicago. He is the author of the Oddball series and Progressive Nation. He has been a regular contributor on travel and culture for Eight Forty-Eight on WBEZ, Chicago's NPR affiliate. He lives in Chicago. Appearing with Jerome Pohlen, author of Oddball Wisconsin. As more and more people seek out regional culinary experiences, Wisconsin Supper Clubs offers a celebration of this distinctly Midwestern tradition that also serves as a practical guide. Profiling more than 50 establishments that are found throughout the state, and threading throughout interviews with proprietors and loyal customers as well as color photographs, author Ron Faiola takes readers deep into the world of this authentic upper Midwestern experience. Each chapter—organized geographically, which makes for easy browsing for those planning a trip—focuses on one supper club, detailing its history and the family or families involved in running it. Faiola describes the customs and traditions of each, details its particular culinary specialties, which include a variety of specialties, ranging from popovers in the northern part of the state to shrimp de Jonghe in the south. One supper club in the Northwoods even serves fry bread, a traditional Native American dish not often found on restaurant menus. With personal reflections of his own experiences capping each section, Faiola provides a broad, yet intimate, look at an establishment that strives to celebrate generations of home-style food and good company. About the Author: Ron Faiola is a filmmaker and author who has produced and directed numerous critically acclaimed documentaries, such as Wisconsin Supper Clubs and Fish Fry Night Milwaukee. He is the president and founder of Push Button Gadget, Inc., which has been specializing in audiovisual and business theater production for nearly 20 years. Best of the Undergraduate Creative Writers, Part One: Marquette University, Alverno College, and Cardinal Stritch. Join us for a lovely evening of promising student readers--the best from three great Milwaukee-area instutions. Next week we'll be featuring UWM, Mount Mary, and Carroll University. Our Marquette readers are Bobby Elliott and Jahnavi Acharya. Our Alverno readers are Kali Stevens and Terri Ward. And from Cardinal Strich, our readers are Robyn White and Daniel Townsend. Jess Walter, author of Beautiful Ruins. National Book Award finalist and Edgar Award winning author Jess Walter returns with his funniest and most romantic novel yet. Hailed by critics and loved by readers, Beautiful Ruins is at once an elegiac romance, a comedy of human foibles, and an incisive meditation on our contemporary obsession with celebrity culture. Spanning fifty years, Walter’s expertly orchestrated narrative takes readers to a tiny coastal village in Italy in 1962 and to modern-day Hollywood, to London, Edinburgh, and the Pacific Northwest—as an endearingly flawed parade of intertwined characters navigate the realities of their lives while clinging to their improbable dreams. Inspired by his wife’s Italian family and the small hillside villages in the Cinque Terre region, Walter imagined a village in its early 1960s La Dolce Vita glory, a place that “would make a great frame for a story about fame and how we all endeavor now to live our lives like movie stars, like celebrities, each of us an eager inner publicist managing our careers and our romances and our fragile self-images (our Facebook pages and Linked-In profiles)." About the Author: Jess Walter is the author of the national bestseller The Financial Lives of the Poets, the National Book Award finalist The Zero, the Edgar Award-winning Citizen Vince, Land of the Blind, and the New York Times Notable Book Over Tumbled Graves. He lives in Spokane, Washington, with his family. Visit our website for more info, to purchase a signed copy, or to figure out why so many of our book jackets don't update correctly on the Indie Next module. Sunday Bestsellers--Interesting Tidbit on The Interestings, Paris Trumps New York, Beautiful Ruins Sales are Beautiful, and Elinor Lipman Hits Four Different Bestseller Lists. Why Hasn't She Written a Board Book? Jason asked me if I knew what was up with Edward Rutherfurd's Paris? In one week, we outsold the complete run of his previous novel, New York. "Well, I thought, our traffic is up, the make up of our customers is a bit different, what with other stores having closed, and then there was that review in the Montreal Gazette." As Jeff Heinrich notes, "Rutherfurd’s prose is so clean and unembellished, the dialogue so fluid and true to the era it’s spoken in, that 'l’appétit vient en mangeant,' as the French say: the more you read, you more you want. The characters are memorable and 'attachant,' even the crooks and low-lifes (and there are a few)." And then of course it's Paris. "Oh, did you know David Sedaris is coming for Let's Explore Diabetes with Owls?" "Shut up. Can I get a ticket?" "There are no tickets. It's Sunday, May 26, 2 pm." Everybody's talking about the Sedaris interview with Terry Gross on Fresh Air. Listen to this now--I dare to call it "soul baring." There's no question about it. Paul blew away from the competition with his St. George pick, Child of God. It's very unlikely that anyone will overtake him, so congratulate him now on his success. And speaking of blowing up competition, Beautiful Ruins is closing in on 100 paperback copies sold before our event on May 6. 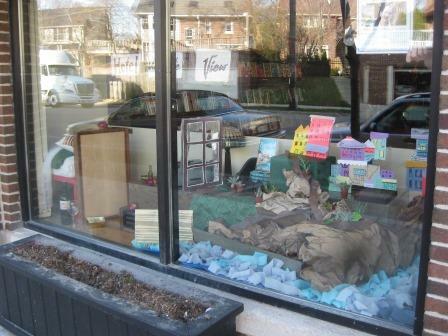 I'm hoping to write a piece on the book this week, featuring our lovely window that Stacie and Hannah dreamed up--perhaps someone at Harper will tell me what exactly exploded the book in paperback beyond word of mouth. Until her kids' book comes out, Elinor Lipman will have to be happy hitting only four of our bestseller lists post her successful literary lunch event. Her essays, I Can't Complain, was #2 in hardcover nonfiction while her tweets, Tweet Land of Liberty, were #2 in paperback nonfiction. In addition, one of her backlist novels also broke the top 10 fiction, despite strong competition. Manger and Smith will be appearing to talk about their kids' Mary Nohl book at the North Shore Library on Thrusday, May 9, 6:30 pm. And for those interested in what's next for Mr. Alexander, his two stories will come together and a third novel that unites the characters of his first two books, or so I'm told. Very exciting! What's on the shortlist for next week's bestsellers? We turn to the Journal Sentinel, where Mike Fischer reviews Edna O'Brien's memoir, Country Girl. He notes that "the first and best of this book's four parts vividly resurrects the Ireland of her childhood--that vanished country of the past which, she tells us, has provided her with 'the richest material of all.'" There's also a memorial to Norbert Blei (oops! typo--I call this writing without a net), a Wisconsin writer, who per writer Jan Uebelherr, started a feud with the local newspaper over the blue tubes they installed for their shopping supplement. He also penned a column on shutting the bridge into Door County so nobody could mess with his beloved adopted home. He was working on a biography of Al Johnson, the famous proprietor of the Swedish restaurant in Sister Bay. And Colette Bancroft riffs on David Sedaris and his new Let's Explore Diabetes with Owls in a review originally published int he Tampa Bay Times. While "laughing her head off", she wonders how he does it. She particularly likes the pieces about his relationship with his father. From the Miami Herald, Hannah Sampson reviews The Interestings, calling it "a story that feels real and true andmore than fulills the promise of the title. It is interesting, yes, but also moving, compelling, fascinating and rewarding." No wonder it's our biggest Meg Wolitzer bestseller to date. 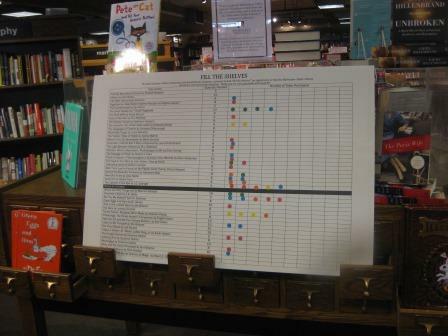 (In fact, our sales at this location have increased in hardcover for each of her last three novels). After several months of basically restocking fixtures, I finally have a few interesting things to display on the blog. 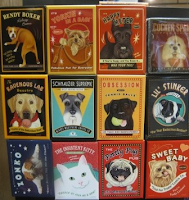 That said, there's still a lot of reordering, like those Retro Pets magnets that sold through so well. I love having Halley receive these, as she gets positively giddy on seeing "Wigglebutt Biscuits" and "Determined German Shepherd's Stout." Anne also received orders from several card vendors, but no new lines, alas. And while there are plenty of dog lovers among Mom's out there, it's hard not to focus on the flowers of spring for a motif, particularly as so many people, me among them, choose to get an arrangement as a gift for this holiday. We think, as an alternative, that you might want to get your Mom a floral pencil topper. 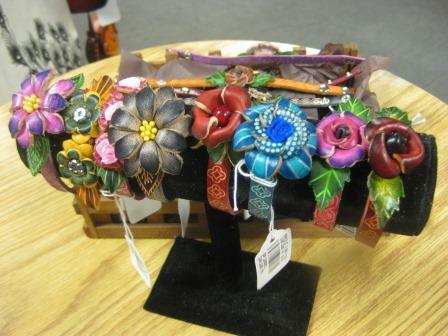 These come from Winding Road, a fair trade importer from Nepal. 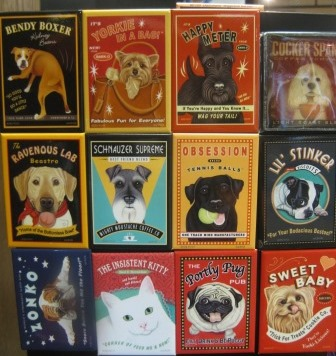 Last year I spotted Marla's products at a temp stand at the Chicago gift show. 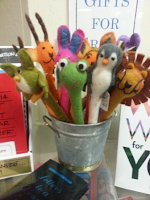 They sat for a while, but picked up when we started putting pencils (we get no end of promotional pencils from publishers) in the pencil toppers to show what they are. Marla told me her main market is museum stores, where they have been moving quite nicely. 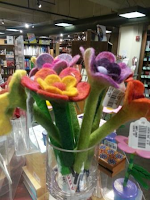 If your Mom is not a flower kind of gal, we're also carrying an assortment of animals, including lions, tigers, owls, penguins, and wildebeests. I was going to have an assortment of bunnies for Easter, but the best laid plans of mice and Daniels meant that this was not the case for 2013. One day I should probably go to a museum show, assuming I am allowed in. Being that we were recently invited to a college bookstore show and get no end of invitations to shows for toy retailers and card retailers, it seems that they are pretty enhusiastic about just getting someone who might buy something, and tend not to close these things off to members. Another floral option are the Sunflower leather bracelets, a new item for us from a vendor I first came across at the Atlanta gift show. At first I was showing them around to booksellers and folks were not particularly enhusiastic. I started worrying that I had bought a dud. Fortunately Halley turned out to be very gung ho and immediately bought one and started talking them up to everybody. Anne had brought in the perfect jewelry stand to display them too. Pretty, huh? 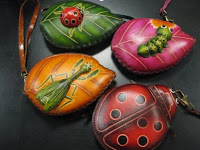 Somewhere between coin pouches and our animal purses are these new wristlets. I love the design, featuring a ladybug, caterpillar, or praying mantis on a leaf. Because I figured ladybug would be the most popular, I also bought a design that is simply one big ladybug. I think they are adoarable, and quite well priced. Next week Halley and I have agreed to have a discussion about Mother's Day cards. I was a little worried because by a week before Mother's Day, our selection starts running low. I think we might move up our post by a few days and do a book post next Saturday instead. You've got to be flexible about these things. The Fill the Shelves Promotion Continues at Boswell. We launched the Milwaukee Public Library Fill-the-Shelves promotion at Kate Atkinson's reading for Life After Life at the Milwaukee Public Market, and continued at the Friends of the Milwaukee Public Library Literary Lunch with Elinor Lipman at the Pfister, but it continues through the end of May in store at Boswell. Want to help the Milwaukee Public Library? Purchase one of these listed titles from Boswell and it will go to the Milwaukee Public Library’s permanent collection. Donate a book and you will get proof of donation, plus a bookplate with your name on it will go in the circulating copy. This program is co-sponsored by the Katie Gingrass Gallery. We've got the complete list of titles here. Spring Rep Night at Boswell--Selections from Anne, John, Terribeth, and Cathy. 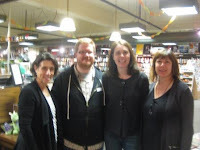 Last Sunday, several of our sales reps presented spring titles to the booksellers at Boswell and Books and Company (editor's note--I inadvertently wrote Next Chapter here, with whom we used to co-host rep nights. My apologies!) We've been doing this in Milwaukee since, well, since before I was a bookseller, but I think this is only the third time we've done this in the spring. It's a nice way to emphasize Mother's Day, Father's Day, graduation, and summer reading, and the reps also get to highlight a fall title they're excited about too. We apologies for the blurry picture. One of my camera settings is off. Cathy at HarperCollins gave us twelve great books to keep in our arsenal. I've mentioned how Mother's Day brings out the fiction releases. One that Sharon's already recommending at Boswell is Reconstructing Amelia, by Kimberly McCreight, which is a what-to-read-when-you've-finished-Gone-Girl kind of book. But I've already written this one up on our recently published posts, but don't forget that this mystery about a woman's daughter who may have beeen murdered "never bogs down and comes to a seamless and unanticipated conclusion," per Kirkus. But why stick to the obvious for Moms? Why not try The Deadly Sisterhood: A Story of Women, Power, and Ingrigue in the Italian Renaissance, 1427-1527, by Leonie Frieda? Frieda, a British popular historian whose last book, Catherine de Medici, her new book has a faster pace than you might expect from what looks like it might be dense and serious. The London Sunday Times wrote: "A torrent of poisoned daggers, ruthless politics and sexual intrigue...An interesting introduction to the turbulent back story to all those serenely smiling portraits." Just in time for Father's Day (releasing May 28), Philipp Meyer's The Son is coming. Author of the acclaimed novel, American Rust, this new book is already winning accolades from visiting author Kate Atkinson, who singled it out as perhaps the best thing she's read this spring. It's a multi-generational saga, tracing one Texas family from the Comanche raids to the oil boom. Jason's already read this one and is tossing about adjectives like "phenomenal" to describe it. We're very excited! And here's a graduation gift from Neil Gaiman. His Make Good Art is coming May 14. It actually seems a little late for graduation for me, considering that we already have our table up, but who am I to judge? Gaiman's The Ocean at the End of the Lane is coming June 18, but alas, not to Milwaukee. But you can still get to Chicago, Minneapolis, or Ann Arbor pretty easily. I like the way each stop has a subtitle. The new book, by the way, is based on a commencement address. Next up was Anne from Macmillan. One Mother's Day pick was Gail Godwin's Flora, a novel set in the 1940s, chronicling a ten-year-old left in the care of her guardian while her father does his secret work at Oak Ridge, Tennessee. Library Journal called the new novel "a superbly crafted, stunning novel" and "an unforgettable, heartbreaking tale of disappointment, love, and tragedy." I've read a lot of Godwin over the years and this sounds very good. If you're dad's baseball fan and also likes those Alex Kotlowitz-y kind of stories, it seems like Jonathan Schuppe's A Chance to Win: Boyhood, Baseball , and the Struggle for Redemption in the Inner City might be just the ticket. Schuppe, a Pulitzer Prize winner, follows a Little League team in Newark for one season, reminding me a bit of the format of education book narratives, like Sarah Carr's recent Hope Against Hope. The starred Booklist said "it may be peculiar to describe a book that looks unflinchingly at urban poverty as wonderful, but in the sense that this account will open eyes and maybe a few minds, wonderful just might apply." A graduation gift might be How to Change the World by John-Paul Flintoff. From Picador's School of Life series, the newest is a recommended by Publishers Weekly with caveats, but "a first push toward directing one's energies outward, this is an encouraging primer." Another new title in the series is How to Find Fulfilling Work. Who doesn't need that? A kid's pick was Sara Varon and Cecil Castelluci's Odd Duck, the charming tale of two unlikely friends. Theodora is prissy, while Chad, her new neighbor, is a hipster. Theodora is thoroughly organized to his slovenliness. When the two are together, they make an interesting pair. Kirkus notes that "this clever celebration of individuality delights" and we all agreed. Amie's already a fan of The Highway Rat, from Julia Donaldson and Axel Scheffler, but I hadn't yet mentioned it on the blog, so I'm glad it was on Terribeth's recommended list. This rat plunders food from all the countryside, but then he meets a duck who sets him off to search for a stash hidden in a cave by his sister. Kirkus thought the story more akin to Robin Hood and the Three Billy Goats Gruff rather than Alfred Noyes's poem, and School Library Journal observed that this "well-paced, rollicking tale is a guaranteed storytime treat." For older readers, Jeffrey Salane's Lawless might be the ticket. M Freeman has been homeschooled all her life, so she doesn't know what to expect when her family enrolls her in the Lawless School. It turns out that her new teachers are preparing her for a life on the wrong side of the law. But when she attracts the interest of The Masters, the school's most secretive clique, she's in for yet another surprise. This is ages ten and up. For ages 13 and up, Paul Rudnick's forthcoming Gorgeous might just be the thing. Becky Randall has been plucked from a trailer park after her mom dies and she is whisked to New York to be made over into a fashion icon by a mysterious designer. Filled with Rudnick's trademark caustic humor (in addition to his New Yorker columns, he's the voice of Libby Gelman-Waxner in Entertainment Weekly), David Sedaris says Mr. Rudnick is"a champion of truth and love and great wicked humor, whom we ignore at our peril." And finally John came to talk about books from Consortium, Chronicle, Candlewick, and even some other publishers and distributors that don't start with a C. His picks ran a little more to the kids' side this time, so no mom/dad/grad business for him. But we did get John read us the story of The Black Rabbit, by Philippa Leathers. As the publisher notes, Leathers introduces us to a plucky rabbit and a friend he can't shake. I think you can guess who that is. With all the Great Gatsby madness out there, John wanted to give a shout out to Superzelda: The Graphic Life of Zelda Fitzgerald, by Tirziana Lo Porto and Deniele Marotta. The beautiful two-color illustrations complement the life of this writer whose success was overshadowed by her famous husband. We'll be talking more about Bennett Sims's A Questionable Shape, a very different kidnd of zombie novel from Two Dollar Radio. Jason loved it, the recommendations from other writesr are piling up, and Stacie noted that Sims is appearing with Fiona Maazel, who just appeared at Boswell yesterday for Woke up Lonely. That seems like an inspired pairing! And finally we've already got piles on our impulse table of the new book from Jeffrey Brown, Vader's Little Princess. Leia starts out as a sweet little girl, but in this sequel to Darth Vader and Son, she grows up into a rather trying teen, with the Sith Lord facing all the tribulations of any father, even one who doesn't lead the Galactic Empire. So those are our some of our reps' suggestions for spring. Did I mention dinner was catered by Beans and Barley? Black bean enchilada casserole, turkey pot pie, spinach cous cous, vegetable tart, plus we also had pie pops, courtesy of an upcoming cookbook that Anne is selling in the fall called Easy as Pie Pops, from Andrea Smetona. They were good! We're hoping the books all get a little more attention, and are on the tips of our tongues when folks come in looking for suggestions. Our St. George's Day Display Recommendations.